South african-born visual artist faith XLVII’s work is located in downtown LA and adorns the city wall, giving a monumental space to some of america’s most marginalized people — the homeless. the installation is titled ‘salus populi suprema lex esto’ — which in latin means ‘the welfare of the people shall be the supreme law’ — and criticises the capitalistic dream, which lacks institutional empathy for non-active participants. Skid row district is home to one of the largest populations of homeless people in the US, with an estimated 2,500 people living on the streets within its 4 square mile radius. the homeless population includes the elderly, those with physical and mental health conditions, addicts, veterans and those that lack the larger familial or structural support systems needed in a financial bind. ‘the work is a continuation of a recent video installation in Jacksonville, Florida titled ‘by virtue of’,’ explains faith XLVII. ‘we’re taking a deeper look at the blind spot in which we as a society fail to engage on a humanistic level with those less fortunate.’ the artist believes a healthy society should provide a wide range of services to assist and help its citizens live a humane and dignified life. access to clean drinking water, education, healthcare, and shelter should be fundamental priorities of any society and government. 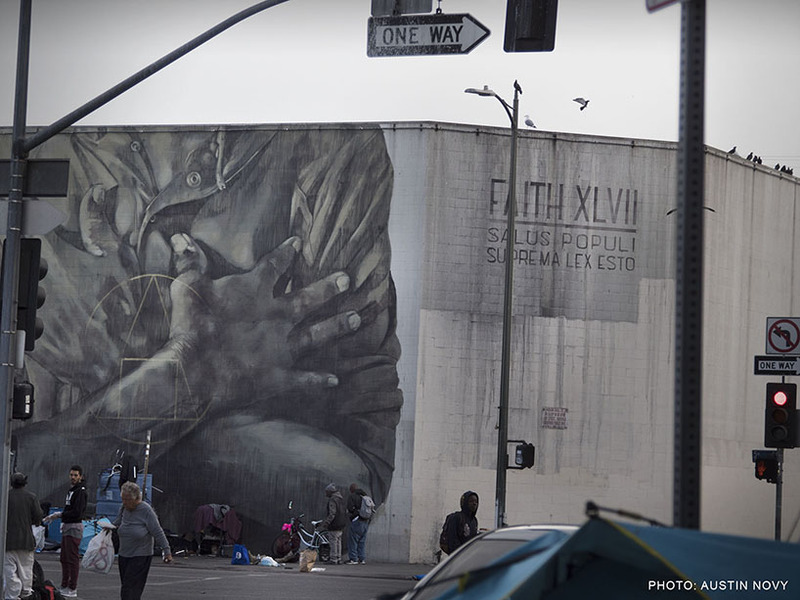 Image : the Faith XLVII in Los Angeles. Photo : Austin Novy.